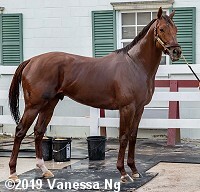 Pegasus World Cup favorite Accelerate poses after his bath on Thursday morning. The third running of the $9 million Pegasus World Cup Invitational (G1) is Saturday at Gulfstream Park and all the horses entered are on the grounds now. A full field of 12 was drawn for the World Cup with no also-eligibles. "New" for 2019 is the $7 million Pegasus World Cup Turf Invitational (G1), formerly run as the Gulfstream Park Turf Handicap. Here are some photos of the horses prepping for the races from Thursday morning. Conditions were excellent during training hours, with partly cloudy skies and temperatures in the high 70's. 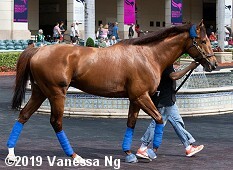 Accelerate schooled in the paddock during the 1st race on Thursday. 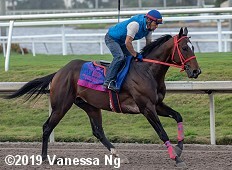 Retired former Gulfstream Park jockey Juan Leyva, now an assistant to trainer John Sadler said, "He's the picture of health. They're both doing really well. They've taken to their surroundings very well. The first day it was just getting acclimated a little to the humidity here, but now they're doing awesome. They're bright. They're happy." Audible galloped once around on the main track. Trainer Todd Pletcher said, "It looks like a race should have a legitimate pace, and I think Audible should appreciate that. 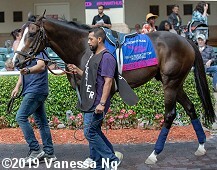 The Florida Derby last year had a hot contested pace and he ran very well in that situation. The Kentucky Derby had a smart pace as well. He's the kind of horse that likes to run in a race where he can settle and later on make a run into solid fractions." 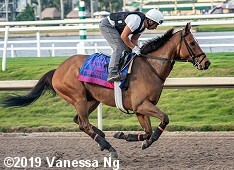 Bravazo went out for a gallop on Thursday. Trainer D. Wayne Lukas said, "We have to take care of the things we can control and that's something we can't control, so we just leave it alone. Here, I think with this field and everything, the way it shook out I don't think it's all that bad. It's a short run to the turn. We've got good gate speed. I don't know that it's that big a disadvantage. Normally, I wouldn't like it. I wouldn't like it in the Derby or the Preakness or a race like that, but it might not fit too badly here." Bricks and Mortar galloped once around in the morning and then schooled in the paddock in the afternoon. 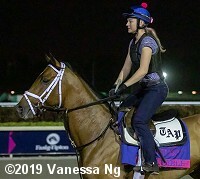 Trainer Chad Brown said, "He's a horse that always showed a lot of promise as a 3-year-old and, unfortunately, he had some injuries and needed a long time away from racing. We were able to get him back in time to have a real productive allowance race and he seems ready to move forward." City of Light galloped once around on Thursday. He retires to Lane's End after Saturday's Pegasus World Cup. Trainer Mike McCarthy said, "I'm very pleased to be drawn into the three-hole. It got down to the wire there with the three or the 12, so we were obviously very grateful to have the three-hole. He's a horse that carries his speed a long way, so hopefully we get a nice, clean break and find ourselves in a good position going into the first turn and turning up the backside. Very pleased with the way he's settled in. I was happy with the way he got over the racetrack Saturday morning. I thought his work was dynamite. He came out of it well and seems to be enjoying himself here. I don't know if a horse could have come into a race better than he did coming into the Breeders' Cup. Obviously, 10 or 11 weeks between races certainly seems to me like he is holding his form. Very pleased with what I've seen so far." Gunnevera drew post 8 and is an 8-1 shot. Trainer Antonio Sano said, "I like the post. He's not outside or inside. He's close to the middle, so it's good. The horse comes from the back, so we hope to have a good pace." Kukulkan represents Mexico in the World Cup, but is a 30-1 outsider drawing post 9. A perfect 14-for-14 including the Caribbean Classic last out over the same distance at Gulfstream and the Mexican Triple Crown, trainer Fausto Gutierrez will have new jockey Frankie Dettori in the irons Saturday. 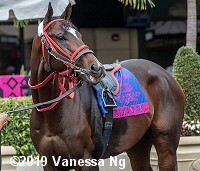 Next Shares drew post 5 in the Pegasus World Cup Turf and is 15-1. Co-owner Michael Iavarone said, "I think it is great. I don't think it was that incredibly important to us. I didn't want to be all the way on the outside. But I think it ended up being really, really good. Speed is outside of us, so I don't think we are going to be trapped on the rail." Patternrecognition drew the outside post 12 in the World Cup. Jose Ortiz gets the call for trainer Chad Brown aboard the 10-1 shot. Seeking the Soul drew post 4 in the World Cup at odds of 12-1. John Velazquez rides for trainer Dallas Stewart. Something Awesome drew post 2 in the World Cup and is 20-1 morning line. Trainer Jose Corrales said, "I think it's OK. You wish to be in the middle, but it's very difficult to get what you want. It's not the best position that you can get at that distance, but I go in with a rider that's won all kinds of races. When you have a rider like him, he knows what to do. They have to break and they have enough time before the first turn to make a decision where he wants to be. He's a horse that you can put anywhere. I think he's going to perform well. I go in with a good feeling that they have to run to beat him, because he's going to compete. It's not easy, but if everything was easy everybody would win the Pegasus." Tom's d'Etat drew post 6 and is a 20-1 outsider on the morning line. Trainer Al Stall Jr. said, "We've always known he's a special talent," Stall said. "There are a lot of things that point to that: His race record, his (speed) figures, things like that are head and shoulders above a normal racehorse. He's just a horse that, unfortunately, had a few nagging injuries over the years. He's actually a really good moving horse, a clean-legged horse, and he's just had some ankle stuff that has flared up from time to time. The good ones overcome it. Obviously, he's got the heart to get through it. There are nine million reasons to run in the Pegasus. We think so much of the horse. He's a big, well-bred, strong horse. Right now he's held up just fine. He hasn't had a chance to string three races together in quite a while. We've just been extremely high on this horse. He's come back off of a long, long layoff and run two outstanding races. This is the kind of race that we thought we'd roll the dice in." True Timber is a 30-1 outsider in the World Cup. Jockey Joe Bravo will breakl from post 7 for trainer Kiaran McLaughlin. Catapult drew post 9 at odds of 7-2 in the Turf. Trainer John Sadler said, "Catapult drew on the outside, but that's not a bad draw from him. He's a turf horse at a long distance that settles and then puts his run in." Channel Maker drew post 3 in the Turf for trainer Bill Mott. Javier Castellano rides the 12-1 shot on Saturday. Delta Prince drew post 8 in the Turf. New jockey Frankie Dettori will be in the irons for trainer Jimmy Jerkens aboard the 15-1 shot. Yoshida is the 5-2 morning line favorite in the Turf. 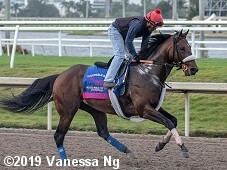 Trainer Bill Mott said, "I guess if he comes out of the Pegasus well, we'll probably try to go to the Dubai World Cup with him. He ran so well in the Breeders' Cup Classic. I think he got beat less than two lengths, had a little bit of a wide trip turning for home. He opted to swing wide in that particular spot and he was beaten by two very good horses. With a great trip, maybe he would have been second. Who knows? He's shown us time after time between the Woodward and also the Breeders' Cup Classic that those are the races that he should be in at the moment."